Bach's sacred and secular cantatas form a cycle by itself, where various compositional techniques are used. Musically they are marked by their varied sequence of sections representing different kinds of compositions: concert, motet, strophic aria and chorale, thus attaining a particularly high degree of independence and correspondence between text and music in line with the Lutheran ideal of "proclamation of the word." (2) A common characteristic of the cantatas as a whole is the framework and some innovations in the instrumental material used. From No. 75 onwards the brass (mainly trumpets and horns) are more strongly employed, the flute is brought into play increasingly after 1724, and the oboe d'amore (from No. 75) and the oboe da caccia, in Bach's time called taille (from No. 167) are introduced as new instruments. Instrumental virtuosity is heightened, and melismatic quality of the vocal writing is further developed. In the third cycle, from 1725 to 1727, the forms include solo and dialogue cantatas and large-scale works in two parts. The third cycle, and also the fourth, make extensive use of preexisting concerto material, perhaps from the Koethen period. From late 1726, obligato organ parts appear (Nos. 35, 146, 169, 49, 88). BWV 69, "Lobe den Herrn, meine 'Seele' " written between 1742 and 1748 used later for the change of town council. This paper will discuss the text of the Cantata No. 35 and the dating of it, but also the Italian influences on Bach's music such as: the madrigal poetry, the stile concitato, and the Affections. Lastly, the discussion will refer to the use of Hebrew letters and to the number symbolism used by Bach. 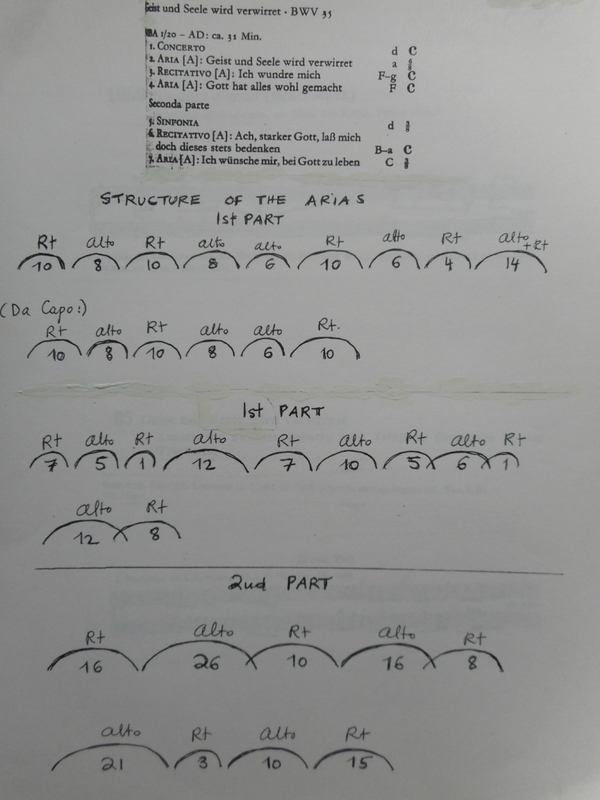 The cantata is written in two parts, the framework of it appearing on the above inserted page. In the practice of the Leipzig Lutheran Liturgy, the first part of a two-part cantata would follow immediately the reading from the Gospel, preceding the Creed and the Sermon. The second part of it would follow the Sermon, "subcommunione." (6) The Latin terms for it were "exordium" (introduction) and "peroratio" (concluding part). The two sinfonias and the two arias of the Cantata BWV 35 are adapted from instrumental material, the two recitativi secchi being the only original parts. In the Schmieder Bach Werke Verzeichnis, (7) a fragment of nine bars of a cembalo concerto (BWV 1059) in D minor is given. It is for strings and, what is unusual for concertos, an oboe doubling violin I.
Geist und Seele wird verwirret: Dating of the Cantata. Spitta's method. Spitta was generations ahead of his time by declaring the watermarks in the paper of the original manuscript. . .(12) And that in the 1870's when a total survey of Bach's work was not yet possible. . . Spitta proves to be right whenever the dates assigned to a watermark are based on at least one composition that is either dated or otherwise unquestionably datable. When, on the other hand, no dated manuscript for a certain paper exists, or when a watermark has one or several variants with which it could be confused, then two areas of possible error become apparent. These dual possibilities of error, in fact, show precisely where and why Spitta made his crucial mistake in dating the works of Bach's Leipzig period. In 1972, Bach's cantata No. 140, "Wachet auf, uns rufft die Stimme," appears in the Norton scores. (13) The editor, Herz, documents the dates of the cantatas. According to this documentation, cantata BWV 35 was written in Leipzig in 1726 with the watermarks as they had appeared in Spitta's survey. The date of Spitta ("not earlier than 1730") (14) proved to be wrong. The Gospel of the 12th Sunday after trinity refers to the Epistel: 2 Corinthians 3, 4-11 (the written law kills, but the Spirit gives life) and to Mark's Evangelium (Mark: 7, 31-37, the incident of the curing of the deaf). Cantata BWV 69a, "Lobe den Herrn meine Seele," refers to the Epistel, to the Evangelium, and to David's Psalm 103, 2: Bless the Lord, oh my soul, and forget not all his benefits. Cantata BWV 137, "Lobe den Herrn, den mächtigen König der Ehren," refers to the Psalm 103 while using as text the five strophes of a song by Joachim Neander, written in 1680. 23: They are renewed each morning, so great is his faithfulness. What all of these cantatas have in common is the praise of God's wonders. Two of them (69a and 137) are based mainly on David's Psalm 103, 2 and begin with the Praise "Lobe den Herrn." In two of them the words "Gott hat alles wohlgemaht" (God has doen everything well) are derived from Mark's Evangelium. 31: He then left Tyrian territory and returned, by way of Sidon to the Sea of Galilee, into the district of the Ten Cities. 32: Some people brought him a deaf man who had a speech impediment and begged him to lay his hands on him. 34: then he looked up to heaven and emitted a groan. He said to him "Ephphatha" (that is, "Be opened"). 35: At once, the man's ears were opened; he was freed from the impediment, and began to speak plainly. Then he enjoined them strictly not to tell anyone; more they proclaimed it. 37: Their amazement went beyond all bounds: "He has done everything well! He made the deaf hear and the mute speak!" Georg Christian Lehms was born 1684 in Liegnitz. After attending the Görlitz grammar school he entered Leipzig University in 1706, becoming a Bachelor of Arts (Baccalaureus Artium) in 1707 and a Doctor of Philosophy (Magister Philosophiae) in 1708. Lehms was keenly interested in music. He was later to meet Christoph Graupner and Gottfried Grünewald in Darmstadt. . . . In year 1710 Lehms was appointed court poet and court librarian in Darmstadt, and shortly afterwards became counselor to the prince. Music history has known Lehms as the supplier of texts for the cantata music of Darmstadt orchestra conductors Graupner and Grünewald. On the other hand Lehms has gone down in the history of literature particularly on account of his lexicon of female poets, "Teuschlands galante Poetinnen," Frankfurt, 1715. . . .
Lehms was not a genius in poetry. However, his language is devoid of both Baroque floridness and amateurish clumsiness. Although basically an orthodox Lutheran, he is, like most of the poets of this period, still not free from pietistic-mystic influences. Lehms championed purity of consonants, and as a man born in Silesia, condemned the Saxons for making words such as "erweichen" and "beugen" rhyme with each other. He shared with Saloms Frank the predilection for unusual word forms ("Gnadenfinger"=clement-finger, "Kummerwolken"=trouble clouds) but especially for etymological figures such as: "ich wundre mich; denn alles, was man sieht, muss uns Verwundrung geben" (appearing in Cantata BWV 35) and later: "wunderreich" (wonder-kingdom), "wunderling" (wonder-thing), "wunderwerke" (wonder-works or creations). 2. polyphonic part-song originating in the 14th century that has parts of three or more voices and is marked by the use of a secular text and a freely imitative style and counterpoint and that in its later development, esp. in the 16th and 17th centuries, is often marked by a distinct melody in the upper voice and by being designed for accompaniment by strings that either double or replace one or more of the voice parts. Grove's New Dictionary of Music and Musicians (20) gives the further information of the madrigal being both a poetic and a musical form of the 14th century Italy. Madrigalian verse in the early 16th century owed its style, imagery, even vocabulary to the lyrics of Petrarch, whose poetry enjoyed an extraordinary revival in this time. Characteristic was the use of word accent and rhyme, and especially the ability to create varied effects. (21) Experiments in chromaticism are to be seen in the motet and the madrigal of the mid-16th century. The text must be the master of the music. This was the essence of the new style, which Monteverdi was to publicize in 1605 at the "seconda prattica." Monteverdi used a particular dissonance treatment and sharp contrast between simple homophony and complex polyphony. He also used duets, as shown in his seventh book (Monteverdi: settimo libro de madrigali, Venice, 1619). Duet sections display a decided preference of 3rds. When the vocal ensemble is a trio, the third voice is usually a bass, which alternately joins in motivic play with the other voices and doubles the basso continuo with the addition of minor embellishments. Such textures were important for the development of two forms: the cantata and the trio sonata. All this information is extremely important to the understanding of the cultural influences underlying the expressive power of the cantatas, especially in the arias and recitatives. Bach's relationship to God (or to Jesus) seems to be of an almost romantic character, as seen in numerous cantatas in the duets between Soul and Jesus. In Cantata WWV 35 this is beautifully demonstrated in the recitative of the 2nd part and in the last aria. The madrigalian feature of the use of thirds and the doubling of the basso continuo is also very much used by Bach. This is not unusual according to the information concerning the services in Leipzig at the years of Bach's presence there. Besides organ playing and the congregational singing of hymns, selected by the kantor, the other musical constituent of the liturgy was the introit motet which would be taken from the "Florilegium Portense" (1603) by Erhard Bodenschatz, a collection mainly drawn from the 16th century (Lassus, Handl, ect.) and was performed "a capella" with harpsichord continuo. (22) Thus we have the proof that Bach was familiar with the works of Lassus and Handl. This is very important information since Lassus and Handl, together with other German composers as Schütz, Monte, Lechner and Hassler, used Italian as well as German texts. By 1540, the great era of the German polyphonic lied had passed and the way for the Italian influence was opened. The two leading printing centers, Nueremberg and Muenich, provided an outlet for Italian madrigal publications. Composers who influenced the young Bach, as cited by C. P. E. Bach (to Forkel) were Froberger, Kerll, Pachelbel, Frescobaldi, Fischer, Strungk, certain French composers, Bruhns, Buxtehude, Reincken and Böhm. As later influences, C. P. E. Bach named Fux, Caldara, Handel, Keiser, Hasse, and the two Grauns, Telemann, Zelenka and Benda. But there is also definite information about the awareness of the works of Palestrina and Pergolesi. We also know that Telemann as well as Strungk had directed the theatre in Leipzig before 1720. Arioso movements appear in the hymn cantatas of Buxtehude, Bruhns, Kuhnau, and Pachelbel, whose works were known to Bach. It is also known that Schütz had studied in Italy where he became acquainted with Monteverdi's "stile concitato." The term "baroque" is derived from the French "baroque," which comes from the Portuguese "barroco," meaning a pearl of irregular or bulbous shape. Rousseau gives a definition in his "Dictionnaire de musique" (Paris, 1768): "A baroque music is that in which the harmony is confused, charged with modulations and dissonances, the melody is harsh and little natural, the intonation difficult, and the movement constrained." (23) Baroque in the sense of bizarre, irregular and extravagant continued to occur sporadically in criticism of art and music in the rest of the 18th century and most of the 19th without acquiring a more generalized stylistic significance. Various traits have been later suggested to clarify the term: dynamics, open form, degree of ornamentation, sharp contrast, coexistence of diverse styles, individualism, affective representation and numerous others. Only one though, of the general characteristics mentioned above, survives on analysis of the 17th- and 18th-century musical thought: the attitude towards affective expression. The fresh insights offered by Ptolemy and Aristoxenus opened up the recognition of chromatic resources and the possibilities of tonal organization outside the modes. Ancient memories of a music that powerfully affected the feelings and morals of men inspired composers to seek effects through music to correspond more closely to the ancients. Greek tragedy which by the interpretation of Aristotle's "Poetics" and other recently studied texts could be shown to have been sung throughout, became a model for the style of music that could be sung on the stage. Experimental science, closely linked with humanism in that it began as a testing of the doctrines found in ancient texts, was another important source of the new trends. The discovery of the true cause and nature of sound, pitch, and pitch relationships liberated musical thought from the sanctity of the number six as the determinant of consonance. This paved the way for equal temperament and modulations between a wider variety of keys. The feeling of bizarre in some of Bach's works resulting from quick modulations is strictly baroque and highly characteristic of this time. The entrance of the aria in the church (esp. the da Capo Aria), chromaticism, dissonance, tonality and freedom in modulation, the affections used in recitativi and arias, all developed until about 1640 in Italy and widespread in Europe, formed the background of Bach's stylistic ideals. The stile concitato came, through Schütz, to Germany. The stile concitato is a term used by Monteverdi to denote a particular style of composition. Monteverdi, following Greek philosophers, believed that music should express three main emotional states of mankind: "anger, moderation, and humility or supplication." The terms he used were: agitated ("concitato"), soft ("molle") and moderate ("temperato"). (25) Although introduced by Schütz, the use of affections, in Germany "Affektenlehre," was not entirely new to the Baroque period. There is evidence of it in the Gregorian chant and it was also used by Renaissance composers as Bichois, Brisnois, Clemens non Papa, Crequillon, Isaac, Josquin, Ockeghem and Verdelot. Lassus, however, was the composer whom theorists regard as a master of musical rhetoric and Lassus was well known to Bach. All this movement led to a systematic use of numerous terms, derived from both the ancient Greek and the Latin. Burmeister (26) expanded a treatise on the doctrine of affections, including a symbolism of different meters used in the Affektenlehre. (27) Triple meters represented the danceable (or terrestrial) passions; duple, the passions that were closest to the divine (ecclesiastical). The term for the ecclesiastical meter was "stile antico." (28) This is a term mostly used to describe church music written after 1600 in an archaic style that imitated Palestrina. It was one of the characteristics of the Baroque period that a self-conscious antithesis between "antico" and "moderno" occur within the church. Initially the terms used by Monteverdi were "prima prattica" and "seconda prattica," as defined in the preface of the fifth book of Madrigals, 1605. The "stile antico" was also brought to Germany through the anthologies of Schadaeus and Bodenschutz. Bach used the Bodenschutz anthology extensively in Leipzig, as mentioned before. It is also known that he possessed a copy of a Palestrina mass with orchestral doubling, a characteristic edition. 1st Part: 1. Sinfonia: The Italian character is evident whenever the right hand of the organ acquires a soloist character. The rhythmic element is held by the basso continuo. There is also a possibility that the material used in the right hand derived from an early violin concerto. 2. Aria: Siciliano character, 6/8 meter. The siciliano is usually in a slow meter often set in a major key, and is closely identified with the pastorale genre. It often bears the affect of nostalgia and resignation, passions naturally attendant on memories of a better world. Notice that the alto sings 'soul and spirit are bewildered / when the might of God I see / All the wonders which He showeth / which His Folk, rejoicing knoweth / deaf and dumb have rendered me.' Resignation about human's incapability to fully understand God's power is evident. Chromatic melismas on the words "verwirren" (bewildered) and "Jauchzen" (rejoice) are used. "Suspiratio" (or breaking up of the phrase to express the meaning of text) is used on the words "taub" and "stumm" (deaf and dumb). Characteristic of the alto voice is the economy in movement. The rhythmic skeleton is held again by the basso continuo. 4. Aria: melismas on "alles," "Tage," "reichen" (all, days, rich). The organ has a soloistic character again. There is an efficient use of instrumentation (basso continuo and organ). 2nd Part: 5. Sinfonia: Concerto character again, with the right hand of the organ as a soloist. The strong rhythmic character is accentuated by the basso continuo and strings. The soloistic treatment of the organ makes us wonder whether the Sinfonia material could have been derived from the 3rd movement of the violin concerto, mentioned before. 6. Recitativo: Affekte are used on the words "starker Gott," "süsses Hephata," "verstickte Herz," "erweichen," "Gnadenfinger," "verloren," "Wunder." 7. Aria: The right hand of the organ accentuates alto's melodic character. Affekte are used as well as strong melismas (or pathopoieia) on the words "martervolles Leben" (Life full of anguish). Bach's mysticism expands from the symbolic use of the notes (as stated above) to the use of Number Symbolism, sometimes exercised in the most intriguing manner. Before discussing the number symbolism in Bach, consider another interesting feature in his music: the use of Hebrew letters. The use of Hebrew letters in church music is not new. In both the gospels according to St. Matthew and St. Mark, we find that the Greek version of the Bible quotes the final words of Christ in Hebrew and then gives the translation. (31) The Hebrew sentence is likewise included in Luther's German Bible and in the English King Jame's edition. In the 16th century, Lassus used the Hebrew letters in the Lamentations of Jeremiah where, for their settings, he devised an entirely new style of composition. Two years later, in 1587, Palestrina used the lamentations too, where all the Hebrew letters were set for the entire chorus of five voices. The Passion, almost from the beginning of the church, was recited by several participants. One chanted the words of Christ, another the narrative, while a "turba," or group of people, took over all the words on the Cross "eli, eli, lama sabächthani" appear before 1500. Beginning with the 16th century, settings of the Passion became more frequent in Germany where Heinrich Schütz wrote three (or possibly four) Passions. His settings of Jesus' last words are particularly poignant. Notice that Bach uses the Hebrew word "Hephata" ("Be opened") in the last recitative as it appears in Luther's German Bible. The word "süsses" (sweet) that precedes the "Hephata" is emphasized harmonically. The colorful harmony used gives this Hebrew word the mystic character appropriate to a miracle by God's son. We do have a kind of "hearsay" evidence by way of a remark by Mattheson to the effect that C. L. Mizler had claimed to have learned some "mathematical bases of composition" directly from Bach. (34) We find another testimony in the writings of Andreas Weckmeister, who was the theory teacher of Bach's cousin, Johann G. Walter, and who was highly esteemed by Bach himself. Bach's uncle, Johann Christoph, also employed symbolic numbers and signs in his works, as did Bach's contemporaries, Mattheson and Handel. Johann Ludwig Bach, in his cantata "Gott ist unsere Zuversicht," uses 59 (gematria for "Gott") measures in his last chorus of this work. Gottfried Leibnitz, the German philosopher of Bach's time, linked French rationalism with Lutheran Protestantism, emphasizing the harmonic relationship between all things created in this world-an idea he took from Johannes Kepler's "Harmoniae Mundi." The connection between numbers and symbols goes back to some of mankind's oldest civilizations. The Babylonians were probably the first people who established a time system based on revolving numbers and observations of the sun, moon and starts. It was Pythagoras and his followers, however, who gave numbers their philosophical importance. Aristotle wrote: "they [the Pythagoreans] believe that numbers are at the origin of all creations. . . they believe that everything is created on the basis of number and harmony and that numbers were the first element." (35) Homer used a system of numbers. The number "88" was gematria for Cronos (Saturn) and Cosmos (Universe) written in Greek. A cryptographic in the form of a word whose letters leave the numerical values of a word taken as the hidden meaning: the cabbalistic method of explaining the Hebrew scriptures by means of a cryptographic significance of the words. Although the term is Hebrew, it may be derived from the Greek γεωμετρία geōmetriā, "geometry", which was used as a translation of gēmaṭriyā, though some scholars believe it to derive from Greek γραμματεια grammateia "knowledge of writing". It's possible that both Greek words had an influence on the formation of the Hebrew word. Some also hold it to derive from the order of the Greek alphabet, gamma being the third letter of the Greek alphabet. The word has been extant in English since the 17th century from translations of works by Giovanni Pico della Mirandola. Although ostensibly derived from Greek, it is largely used in Jewish texts, notably in those associated with the Kabbalah. The term does not appear in the Hebrew Bible itself. a system of occult theosophy or mystical interpretation of the scriptures originally developed orally among Jewish rabbis in the Geonic period (Babylonian) and transmitted to certain Medieval Christians, holding such tenets as creation through emanation, supremacy of man's spirit over his desires, Messianic restoration of the world to a perfect state, and laying stress on hidden sense in the scriptures and occult meanings of interpretation even to foretelling events by these methods. These beliefs were taken up in late Hellenistic and early Christian times by many of the mystic sects, particularly by the Gnostics. Although the Christian church refuted such theories, many of the great doctors and saints accepted some of their tenets--particularly Tertullian and St. Augustine, who again transmitted these thoughts to the Middle Ages--and, through Medieval thought, to later times. Therefore, it should not surprise us to find that in the music of Dufay, Ockeghem, Obrecht, Josquin and Isaac, the numbers 3, 5, 7, and 12--all of great symbolic importance, occur regularly. Out of sixty Masses of Dufay and Josquin which Fritz Feldmann examined, he found only three which were without number symbols. (36) Randolph Currie, (37) in "Bach's Overt Gesture" as he calls it, has shown how Bach uses the number 84, found at the end of his manuscript of the B-minor Mass. The number is to be seen at the right bottom of the manuscript. Friedrich Smend (38) who made the discovery, assures that the figures are in Bach's handwriting. An extensive study of Bach's works shows how much more we have to discover in his music. Bach's compositions show an extremely complex and intelligent structure: Simplicity in complexity. 1. The New Grove Dictionary of Music and Musicians, Vol. 1. Editor: Stanley Saide. London: Macmillan Publishers Limited, 1980, pp. 804-818. 2. The New Grove Dictionary of Music and Musicians, Vol. 1, pp. 804-818. 3. The New Grove Dictionary of Music and Musicians, Vol. 1, pp. 804-818. 4. Bach: The Quarterly Journal of the Riemenschneider Bach Institute. Editor: Elinore L. Barber. Baldwin-Wallace College, Berea, Ohio, 1970. Vol. I, No. 4, pp. 9-15. Gerhard Herz (University of Louisville). Toward a New Image of Bach. 5. Bach: The Quarterly Journal of the Riemenschneider Bach Institute, pp. 9-15. 6. The New Grove Dictionary of Music and Musicians, Vol. 3, pp. 795-796. 7. Schneider, Wolfgang: Thematich-Systematisches Verzeichnis der Musikalischen Werke von Johann Sebastian Bach, VEB Breitkopf und Härtel Musikverlag. Leipzig, 1958. 8. Whittaker, Gillies W. The Cantatas of Johann Sebastian Bach. Sacred and Secular. London: Oxford University Press, 1959, Vol. II, pp. 241-242. 9. Whittaker, Gillies W., pp. 241-242. 10. Whittaker, Gillies W. The Cantatas of Johann Sebastian Bach. Sacred and Secular. London: Oxford University Press, 1959, Vol. I, pp. 245-246. 11. Bach: The Quarterly Journal of the Riemenschneider Bach Institute, pp. 9-15. 12. Phillipp Spitta. Johan Sebastian Bach. London: Novello and Company, 1899, Vol. II, pp. 698-700. 13. J. S. Bach. Cantata No. 140 "Wachet auf, uns ruft die Stimme." Norton Critical Scores. Editor: Gerhard Herz, p. 22. 14. Phillipp Spitta, pp. 698-700. 15. Bach Yearbook 1970 (not available). 16. Alfred Duerr. Georg Christian Lehms. Das Kantatenwerk. The Complete Cantatas. Germany: Royal Sound Records. 17. Werner Neumann. Sämtilche von Johann Sebastian Bach vertonte texte. VEB Deutscher Verlag für Musik, Leipzig, 1974, pp. 256, 261. Georg Christian Lehms. "Gottgefälliges Kirchen-Opffer." (Darmstadt 1711). Hersische Landes and Hochshulbibliothek Darmstadt. 18. The New Grove Dictionary of Music and Musicians, Vol. 13, pp. 154-155. 19. Webster's Third New International Dictionary of the English Language Unabridged. Springfield, Mass: Merriam Company Publishers, 1964, p. 1357. 20. The New Grove Dictionary of Music and Musicians, Vol. 11, pp. 461-475. 21. The New Grove Dictionary of Music and Musicians, Vol. 11, p. 463. 22. The New Grove Dictionary of Music and Musicians, Vol. 10, p. 636. 23. The New Grove Dictionary of Music and Musicians, Vol. 2, pp. 172-178. 24. The New Grove Dictionary of Music and Musicians, Vol. 2, pp. 172-178. 25. The New Grove Dictionary of Music and Musicians, Vol. 18, p. 145. 26. The New Grove Dictionary of Music and Musicians, Vol. 15, pp. 793-802. 27. Wye Jamison Allanbrook. Rhythmic Gesture in Mozart (Le Nozze di Figaro and Don Giovanni). Chicago: University of Chicago Press, 1983. 28. The New Grove Dictionary of Music and Musicians, Vol. 18, p. 144. 29. Bach: The Quarterly Journal of the Riemenschneider Bach Institute, Hans T. David. Bach's Problems and Artistic Creed, 1970, p. 11. 30. Bach: The Quarterly Journal of the Riemenschneider Bach Institute. Hans T. David, 1970, p. 10. 31. Bach: The Quarterly Journal of the Riemenschneider Bach Institute. Vol. II, No. 2., 1971, pp. 13-17. 32. Bach: The Quarterly Journal of the Riemenschneider Bach Institute. Elinore L. Barker, Editor. Vol. V, No.1, 1974, p. 23. 33. Bach Reader. (rev. ed.) New York, 1966, p. 400. The passage is quoted from Mattheson's "Grundlage einer Ehrenforte" (1740). 34. Bach: The Quarterly Journal of the Riemenschneider Bach Institute, Vol. VI, No. 3., 1975, pp. 11-19. Arthur Hirsch. (Yveliness, France). Number Symbolism in Bach's First Cantata Cycle: 1723-1724--Part I. 35. Bach: The Quarterly Journal of the Riemenschneider Bach Institute, Arthur Hirsch, pp. 11-19. 36. Fritz Feldmann. "Numerorum Mysteria," Archiv für Musikwissenschaften 14 (1957, No. 2): pp. 102-129. 37. Bach: The Quarterly Journal of the Riemenschneider Bach Institute, Vol. V, No. 1, pp. 23-31, 1974. Randolph N. Currie. (Ohio State University, Newark). A Neglected Guide to Bach's Use of Number Symbolism--Part I. 38. Friedrich Smend. Kritisches Bericht, NBA, Ser. II, Bd. 1 (Kassel and Basel, 1956), p. 333.